Fluid bed dryers are designed to dry small particles of product by using air or some other gas. Fluid air bed dryers hold product in a product bowl or bed. Air is drawn through the product bed because of a vacuum created in the expansion chamber above the product bed. The air passing through the product bed causes the small particles of the product to separate slightly which results in the particles of product behaving as a fluid (hence the name fluid bed dryer). As air passes around the small particles of product held in the product bed, the air draws moisture out from the particles and the air carries the moisture away as the air is discharged from the fluid bed dryer. Using a fluid bed dryer to dry product particles causes the product to remain cool because of the evaporation of moisture, so fluid bed drying can be used for heat sensitive materials. Glatt, Model WSG-15, (3) section, stainless steel, fluid bed granular dryer, with 15Kg, 45 liter or 99 pound batch working capacites. Rated up to 880 CFM and 120,000 BTU with pounds of product per hour – depending on materials and application. Equipped with top exhaust valve and 22" OD x 12" long top exhaust air filter section, 22" OD x 20" long middle section with coaxial spray nozzle, 22" OD x 11" long product container with (4) leg cart and casters, 22"OD x 12" long bottom dump discharge section all with 4" OD sight ports with 2" OD side air inlet port and 2" OD bottom drain. Control panel has air, filter, heating, cooling and auto / manual and fan / exhaust controls, megnehelic water gauges with Honeywell chart recorder. Mounted on heavy duty base frame. Glatt Model GPCG1, modular, lab size batch fluid bed dryer capable of drying, agglomerating, fine particle and tablet coating with batch sizes from 0.3 to 5 kilograms – depending on materials and application. Control panel with air velocity and exhaust gauges inlet and exhaust air temp controllers, supply air, operating, spray nozzle and purge air gauges with exhaust air flap speed dial. Glatt ‘Uni-Glatt’ lab size fluid bed dryer capable of drying, mixing and coating tablets, hard/soft gel capsules, metal beads & seeds as per the fluidized bed system from .5 to 3.0kg. Uses 4 x 440 kW of heat, 144 cfm fan and has a 4" discharge. Available with the WSG Drying Column or Wurster Liquid spray column. System can dry conventional granules, powders & crystalline substances. Unit mounted on s/s base w/casters. Batch style fluid bed dryer / granulator system consisting of main tower assembly, air discharge bag filtration system, air handling unit with HEPA filtration, roof top blower and associated control cabinets. Warm filtered air is drawn in from the bottom of the tower crossing the air slit between rotor disc and product container, creating a whirling effect. This air flow, along with the rotation of the disc, result in a doughnut like movement of the product providing uniform exposure of air to particle surface. Injecting liquids through the spray nozzle during this process allows for granulation of the particles. The bag type filter system at the air outlet retains the suspended particles. 304 Stainless steel contact parts with polished interior. 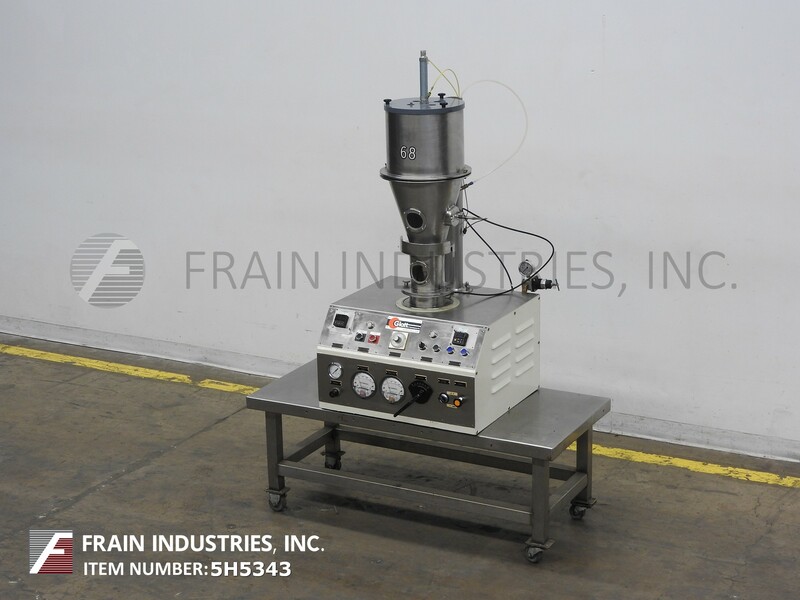 310 Liter or 11 cu ft stainless steel fluid bed dryer, recommended batch weights 190-470 lb, or 86-214 KG. Fan rate 2200 cfm. Drying is achieved in a FitzAire sytstem as gas flows upward through the solids in the container. Gas is pulled through the bed, partially suspending the particles in the gas stream in a random, boiling motion. Drying occus as moisture is transferred from the particles to the fluidizing gas. Has one bowl and cart and second available at additional cost.